Mopo Doufu is Jan’s favorite dish. She also prefers it the traditional way that Mao Zedong liked it, made with “stinky tofu.” Mopo Doufu actually takes days to make it properly, because first you need to let the tofu go “bad.” Fortunately she also likes it with made with fresh tofu, which is what I will be doing today. Note: This is how you make proper “stinky” tofu. Use an extra firm block of tofu. Leave the tofu uncovered in your refrigerator for 3 to 5 days. The tofu will develop a strong sour smell and may pick up some pink mold. Rinse the mold off before using. Mopo Doufu is a signature Sichuan recipe. 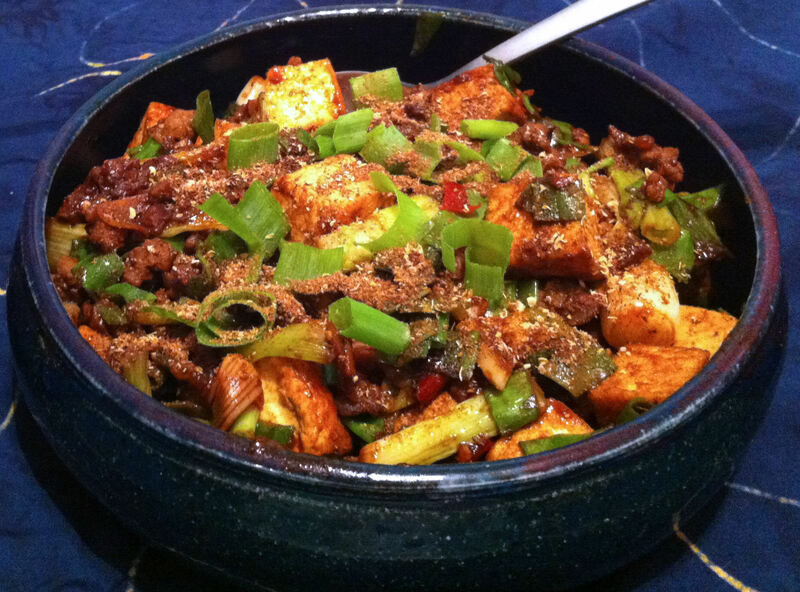 The key elements of the dish, besides tofu, are the brown bean sauce and the Sichuan Pepper. If you go to a Cantonese or Mandarin Chinese restaurant you may find “Mapo Tofu” on the menu, but it will be served without the Sichuan Pepper. The “honest” restaurants will call this dish “Tofu in Spicy Brown Sauce.” If it doesn’t have the Sichuan pepper, it is not “Mapo.” In Chengdu, we have ordered this dish and gotten it literally black from all of the Sichuan pepper on top. Since sugar is a main ingredient in this sauce, sweet bean paste is something to be avoided on a Ketogenic diet. However, the ratio of sauce to other ingredient is small. If you do not use it as your main dish, you could eat some and still be within acceptable limits. Note: If I was not adapting this recipe for a ketogenic diet, I would normally use peanut oil, instead of canola oil, and I would add a ¼ tsp. of sugar the meat marinade. 1. Several hours before dinner, drain and place the tofu block on a large plate. Place a smaller inverted plate on top of the tofu. Place a weight on the top to press the liquid out of the tofu. Pour off any liquid that has seeped out of the tofu. 2. When you have pressed as much liquid out of the tofu as you can, cut the tofu into ¾ to 1 inch cubes and set aside. 2. Mince the pork into small bits (or use ground pork). Marinate the pork in 1 tsp. soy sauce and ½ tsp. of sesame oil for 10 to 20 minutes. 3. Cut the white part of the green onions into 2 inch pieces and reserve. Chop the green parts of the onions finely and set aside. 4. Slice or mince the garlic and set it aside. 5. Sliver the ginger root by cutting it in thin slices. Stack the slices and cut them thinly once more. 6. Put the ginger and the rest of the sauce ingredients in a small bowl. 7. In a sauté pan over a medium high heat, add 1 tablespoon of canola oil and brown the tofu lightly. When done remove to a bowl. Tip: You are not trying to brown the cubes completely. You just want to get a slight browning on two or three sides. 8. Add the rest of the canola oil to the pan and brown the pork. 9. When the pork is well browned, add the white parts of the green onion and stir fry for two more minutes. 10. Pull the onions and pork to the sides of the pan and add half of the Sichuan pepper to the open space. Cook the spice for 15 seconds and then mix it in to the other ingredients. 11. Return the tofu to the pan and add the sauce. Cook for two to three minutes tossing to coat the tofu. 12. Stir in most of the green parts of the onion into the mixture. Remove the mopo doufu to a serving bowl and sprinkle the rest of the Sichuan pepper over it. 13. Garnish with the remaining green onion.